NETWORK UPDATE: A bumpy night for adjustments, with 0.1 deductions for 20/20, DATELINE, both reruns of WHOSE LINE IS IT ANYWAY, and the JANE THE VIRGIN rerun. 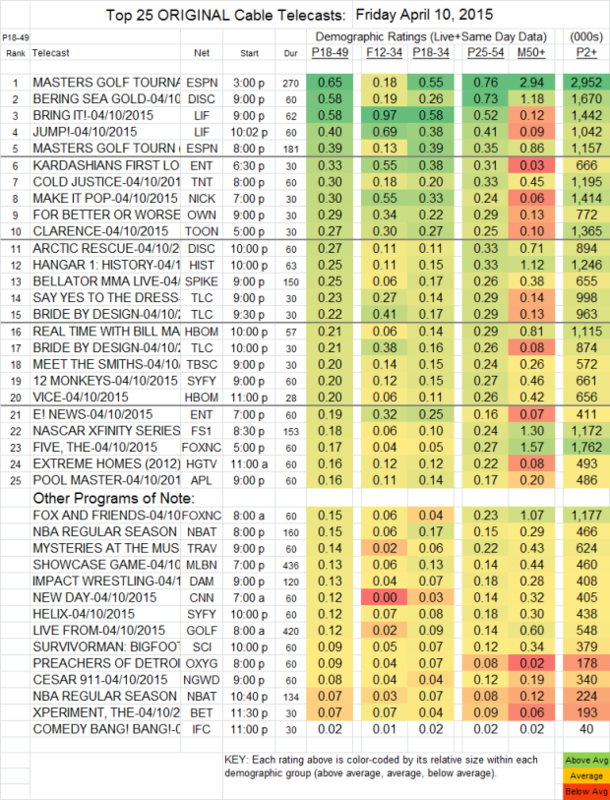 ESPN’S coverage of THE MASTERS took Friday cable honors at 0.65, with the evening round-up at 0.39. The top non-sports show of the night isn’t on the chart for technical reasons (it wasn’t listed as an original by Adult Swim), but CHILDREN’S HOSPITAL returned at 0.61, with 1.26M total viewers. Discovery followed, with BERING SEA GOLD steady at 0.58, but ARCTIC RESCUE went down 0.07 to 0.27. Lifetime’s BRING IT rose 0.07 to 0.58, and the new JUMP debuted at 0.40. An E! KARDASHIANS FIRST LOOK special was at 0.33, and THE GRACE HELBIG SHOW (not on the chart) grew by 0.03 to 0.12, although total viewers were more stable, up by a mere 9000 to 236K. On TNT, COLD JUSTICE returned at 0.30. OWN’s FOR BETTER OR WORSE gained 0.04 to 0.29. BELLATOR MMA LIVE (Spike) was at 0.25. On HBO, REAL TIME WITH BILL MAHER was at 0.21, with VICE at 0.20. The season finale of 12 MONKEYS (Syfy) held at 0.20, and the season finale of HELIX dropped 0.04 to a dismal 0.12. COMEDY BANG BANG (IFC) remained at 0.02. Here’s the IMPACT WRESTLING (DAM) lowdown: the 9PM original run was steady at 0.13 in 18-49s, down 35K viewers to 408K, and in households, up 0.02 in audience to 0.27 but down 25K in number of households (not as contradictory as it sounds). The 11PM re-airing added 0.06 in 18-49s, 175K total viewers, and 0.09/110K households.